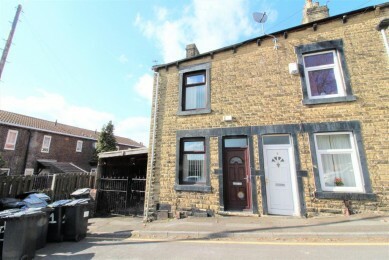 **AVAILABLE WITH NO UPWARD CHAIN** Gates estates are pleased to present to the market this two bedroom end of terrace house. Having accommodation comprising; lounge, kitchen, two bedrooms and bathroom. The property enjoys gas central heating, double glazing, a large rear garden and large car port to the side for parking. MUST BE VIEWED. This well presented room has carpeted flooring, radiator and a front facing double glazed window. There is also an open stairway leading to the first floor and access to the kitchen/diner. Having a range of wall and base units with work surfaces which incorporates a stainless steel sink and drainer. There is plumbing for an automatic washing machine and integrated oven and hob. There is a rear facing double glazed window looking out to the garden. Access is given to a storage cupboard located beneath the stairs which leads down to the cellar. The fireplace is exposed and there is access to the rear garden. Access to the loft, two bedrooms and bathroom. A front facing bedroom which has a radiator and double glazed window. This room also boasts a large integrated wardrobe located over the stairs. There is also a feature fireplace. With a radiator and rear facing double glazed window and integrated wardrobe. Having a three piece suite in white comprising, bath, low flush wc and pedestal wash basin. There is a chrome heated towel radiator and rear facing double glazed opaque window. Car port to the side of the property which can easily house 2 cars.